Families – join us anytime between 1 and 7:30 pm for all kinds of Christmas stories! 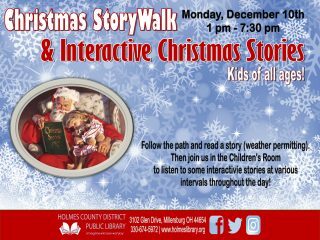 Following the path and read a Christmas story on our StoryWalk(R) (weather permitting). The come into the Children’s room to listen to some interactive stories at various intervals throughout the afternoon and evening.